We pushed out the first version of the Open Journalism site in January. 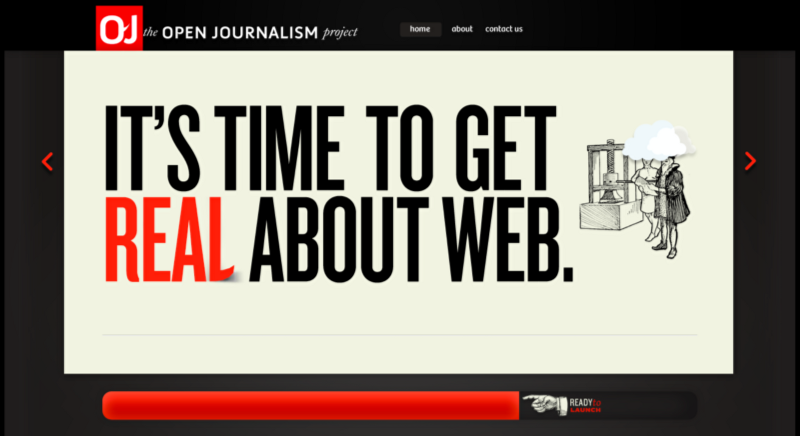 Our goal is for the site to be a place to teach students what they should know about journalism on the web. It should be fun too. Topics like mapping, security, command line tools, and open source are all concepts that should be made more accessible, and should be easily understood at a basic level by all journalists. We’re focusing on students because we know student journalism well, and we believe that teaching maturing journalists about the web will provide them with an important lens to view the world with. This is how we got to where we are now. In late 2011 I sat in the design room of our university’s student newsroom with some of the other editors: Kate Hudson, Brent Rose, and Nicholas Maronese. I was working as the photo editor then—something I loved doing. I was very happy travelling and photographing people while listening to their stories. Photography was my lucky way of experiencing the many types of people my generation seemed to avoid, as well as many the public spends too much time discussing. One of my habits as a photographer was scouring sites like Flickr to see how others could frame the world in ways I hadn’t previously considered. I started discovering beautiful things the web could do with images: things not possible with print. Just as every generation revolts against walking in the previous generations shoes, I found myself questioning the expectations that I came up against as a photo editor. 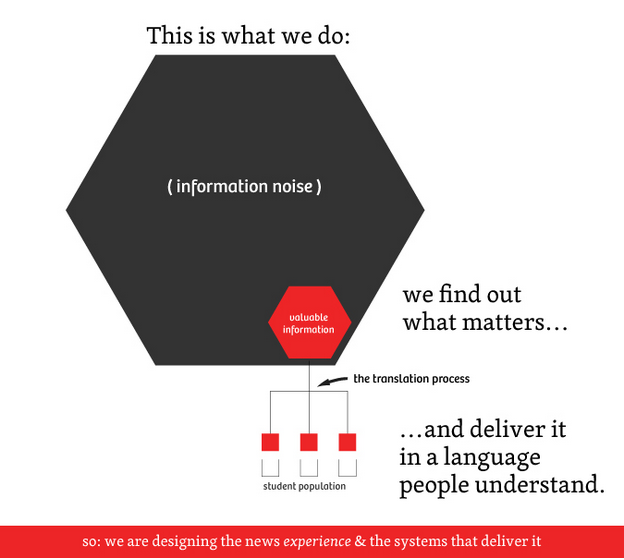 In our newsroom the expectations were built from an outdated information world. We were expected to fill old shoes. So we sat in our student newsroom—not very happy with what we were doing. Our weekly newspaper had remained essentially unchanged for 40+ years. Each editorial position had the same requirement every year. The big change happened in the 80s when the paper started using colour. We’d also stumbled into having a website, but it was updated just once a week with the release of the newspaper. We spent much of the rest of the school year asking “what should we be doing in the newsroom?”, which mainly led us to ask “how do we use the web to tell stories?” It was a straightforward question that led to many more questions about the web: something we knew little about. Out in the real world, traditional journalists were struggling to keep their jobs in a dying print world. They wore the same design of shoes that we were supposed to fill. Being pushed to repeat old, failing strategies and blocked from trying something new scared us. We had questions, so we started doing some research. We talked with student newsrooms in Canada and the United States, and filled too many Google Doc files with notes. Looking at the notes now, they scream of fear. We annotated our notes with naive solutions, often involving scrambled and immature odysseys into the future of online journalism. There was a lot we didn’t know. We didn’t know how to build a mobile app. We didn’t know if we should build a mobile app. We didn’t know how to run a server. We didn’t know where to go to find a server. 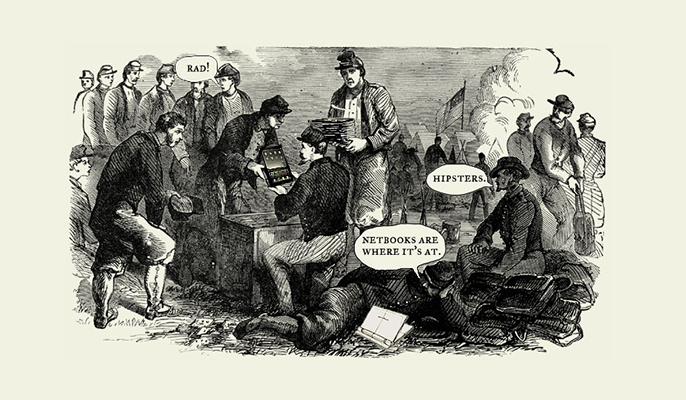 We didn’t know how the web worked. We didn’t know how people used the web to read news. We didn’t know what news should be on the web. If news is just information, what does that even look like? We asked these questions to many students at other papers to get a consensus of what had worked and what hadn’t. They reported similar questions and fears about the web but followed with “print advertising is keeping us afloat so we can’t abandon it”. In other words, we knew that we should be building a newer pair of shoes, but we didn’t know what the function of the shoes should be. Our questioning of other student journalists in 15 student newsrooms brought up a few repeating issues. Lack of diverse skills within the newsroom. Writers made up 95% of the personnel. Students with other skills were not sought because journalism was seen as “a career with words.” The other 5% were designers, designing words on computers, for print. Common problems in student newsrooms (2013) Two years later, we went back and looked at what had changed. We talked to a dozen more newsrooms and weren’t surprised by our findings. Overly restricted access to student website technology. Changes are primarily visual rather than functional. Instead of having computers that are locked down, try setting aside a few office computers that allow students to play and “break”, or encourage editors to buy their own Macbooks so they’re always able to practice with code and new tools on their own. From all this we realized that changing a student newsroom is difficult. It takes patience. It requires that the business and editorial departments of the student newsroom be on the same (web)page. The shoes of the future must be different from the shoes we were given. 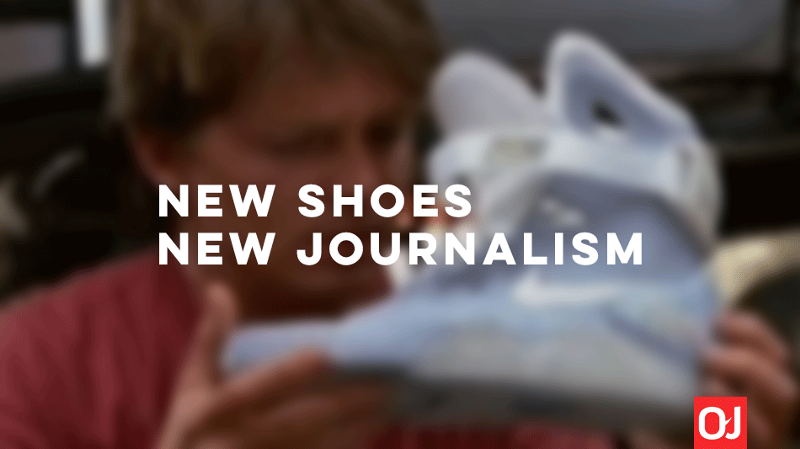 We need to rethink how long the new shoe design will be valid. It’s more important that we focus on the process behind making footwear than on actually creating a specific shoe. We shouldn’t be building a shoe to last 40 years. Our footwear design process will allow us to change and adapt as technology evolves. 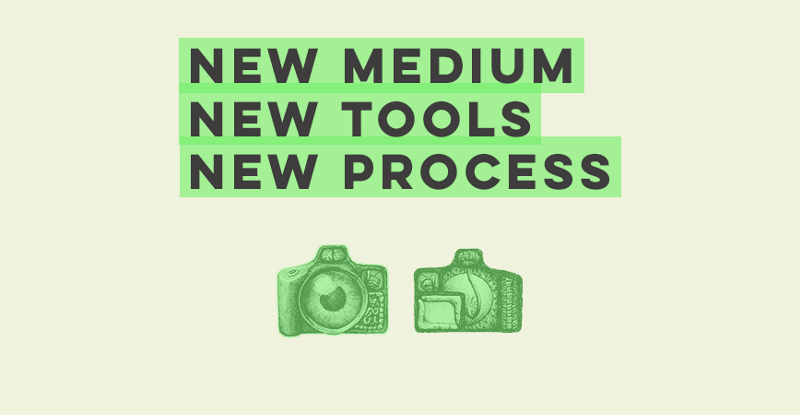 The media landscape will change, so having a newsroom that can change with it will be critical. We are building a shoe machine, not a shoe. A train or light at the end of the tunnel: are student newsrooms changing for the better? In our 2013 research we found that almost 50% of student newsrooms had created roles specifically for the web. This sounds great, but is still problematic in its current state. A web editor could do much more than simply being in charge of the social media accounts for the student paper. Their responsibility could include teaching all other editors to be listening to what’s happening online. The web editor can take advantage of live information to change how the student newsroom reports news in real time. The goal of having a web editor should be for someone to build and tell stories that take full advantage of the web as their medium. Too often the web’s interactivity is not considered when developing the story. The web then ends up as a resting place for print words. Editors at newsrooms are still figuring out how to convince writers of the benefit to having their content online. There’s still a stronger draw to writers seeing their name in print than on the web. Showing writers that their stories can be told in new ways to larger audiences is a convincing argument that the web is a starting point for telling a story, not its graveyard. When everyone in the newsroom approaches their website with the intention of using it to explore the web as a medium, they all start to ask “what is possible?” and “what can be done?” You can’t expect students to think in terms of the web if it’s treated as a place for print words to hang out on a web page. We’re OK with this problem, if we see newsrooms continue to take small steps towards having all their editors involved in the stories for the web. Our rough research has told us newsrooms need to be reorganized. This includes every part of the newsroom’s workflow: from where a story and its information comes from, to thinking of every word, pixel, and interaction the reader will have with your stories. 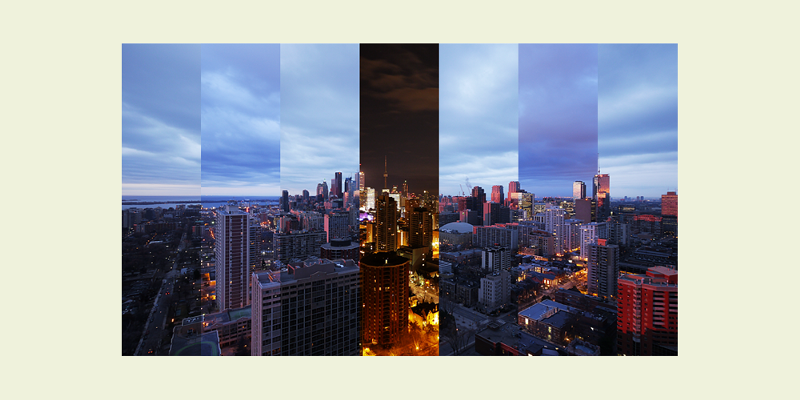 If I was a photo editor that wanted to re-think my process with digital tools in mind, I’d start by asking “how are photo assignments processed and sent out?”, “how do we receive images?”, “what formats do images need to be exported in?”, “what type of screens will the images be viewed on?”, and “how are the designers getting these images?” Making a student newsroom digital isn’t about producing “digital manifestos”, it’s about being curious enough that you’ll want to to continue experimenting with your process until you’ve found one that fits your newsroom’s needs. Lack of mentorship is still a big problem. Google’s fellowship program is great. The fact that it only caters to United States students isn’t. There are only a handful of internships in Canada where students interested in journalism can get experience writing code and building interactive stories. We’re OK with this for now, as we expect internships and mentorship over the next 5 years between professional newsrooms and student newsrooms will only increase. It’s worth noting that some of that mentorship will likely be done remotely. Skill diversity needs to change. We encourage every student newsroom we talk to, to start building a partnership with their school’s Computer Science department. It will take some work, but you’ll find there are many CS undergrads that love playing with web technologies, and using data to tell stories. Changing who is in the newsroom should be one of the first steps newsrooms take to changing how they tell stories. The same goes with getting designers who understand the wonderful interactive elements of the web and students who love statistics and exploring data. Getting students who are amazing at design, data, code, words, and images into one room is one of the coolest experience I’ve had. Everyone benefits from a more diverse newsroom. We don’t know how to best teach students about the web. It’s not efficient for us to teach coding classes. We do go into newsrooms and get them running their first code exercises, but if someone wants to learn to program, we can only provide the initial push and curiosity. We will be trying out “labs” with a few schools next school year to hopefully get a better idea of how to teach students about the web. We don’t know how to convince the business side of student papers that they should invest in the web. At the very least we’re able to explain that having students graduate with their current skill set is painful in the current job market. We don’t know what journalism or the web will be like in 10 years, but we can start encouraging students to keep an open mind about the skills they’ll need. We’re less interested in preparing students for the current newsroom climate, than we are in teaching students to have the ability to learn new tools quickly as they come and go. A concise guide to building stories for the web There are too many options to get started. We hope to provide an opinionated guide that follows both our experiences, research, and observations from trying to teach our peers. Student newsrooms don’t have investors to please. Student newsrooms can change their website every week if they want to try a new design or interaction. As long as students start treating the web as a different medium, and start building stories around that idea, then we’ll know we’re moving forward. We’re also asking professional newsrooms to be more open about their process of developing stories for the web. You play a big part in this. This means writing about it, and sharing code. We need to start building a bridge between student journalism and professional newsrooms. We going to continue slowly growing the content on Open Journalism. We still consider this the beta version, but expect to polish it, and beef up the content for a real launch at the beginning of the summer. We expect to have more original tutorials as well as the beginnings of what a curriculum may look like that a student newsroom can adopt to start guiding their transition to become a web first newsroom. We’re also going to be working with the Queen’s Journal and The Ubyssey next school year to better understand how to make the student newsroom a place for experimenting with telling stories on the web. If this sound like a good idea in your newsroom, we’re still looking to add 1 more school. We’re trying out some new shoes. And while they’re not self-lacing, and smell a bit different, we feel lacing up a new pair of kicks can change a lot. We’re still in the early stages of what this project will look like, so if you want to help or have thoughts, let’s talk. This isn’t supposed to be a manifesto™© we just think it’s pretty cool to share what we’ve learned so far, and hope you’ll do the same. We’re all in this together.